Take a medium-sized bowl and add to it the red onion, jalapeño, 1 teaspoon of the agave and juice of 1 lime (we accidentally juiced 2 limes), stirring to combine. Season the mixture with salt and pepper to taste, tossing everything together. Let the onion mixture sit for at least a few minutes or until juices start to accumulate. Make sure to stir the onions around again one more time right before serving. While the onions sit, take a large nonstick skillet out and pour the oil in (making sure that the oil covers the entire bottom of the skillet), setting the heat to medium-high. Once you see the oil rippling and beginning to smoke**, add the chicken in, breaking the meat up into bite-size pieces with a spoon. Cook the chicken for 3 minutes or until browned (our chicken wasn’t browned by the 3-4 minute mark but we decided to move on ‘cause we didn’t want dry chicken). Add the onion, garlic, coriander, cumin and cinnamon and stir constantly for a minute to get the spices toasted. Add in ½ cup of the chicken stock, the 2 tablespoons of chipotle puree, and the remaining agave. Once the mixture’s bubbling, turn the heat down to medium-low. Simmer for 10 to 15 minutes (we went with 10 minutes) or until all of the flavors have melded and the sauce has thickened, adding in more stock if the mixture gets dry (we added the other ½ cup during the 10 minutes). Stir in the remaining lime juice (we juiced 2 limes for this part), taking the skillet off the heat afterwards. We took a bite at this point and thought it tasted bland so we added in some more kosher salt). When there’s only 5 to 8 minutes left for the chicken to simmer, place the taco shells on a baking sheet (we lined our baking sheet with aluminum foil first) and let them bake until golden for 5 to 8 minutes (we went with 8 minutes). Since our shells weren’t flat-bottomed, we flipped them over at the 5 minute mark when we saw they weren’t golden yet. Fill up the shells with some chicken, adding on the pickled onions, cheese, lettuce, tomatoes, cilantro and hot sauce afterwards. *Since our limes were small, we had planned on using just one lime for the onions and 2 for the chicken but we accidentally used 2 limes with the onions and decided to still use 2 limes for the chicken. **We added the chicken in when the oil was hot but not smoking. This was a delicious taco ! We loved the heat and acidity in this and the variety of contrasting textures as well. We got this recipe from Rachael Ray magazine. We weren’t paid in any form to promote Tabasco or Rachael Ray. Take a large mixing bowl out and stir together the lime gelatin, lemon gelatin and boiling water until the gelatin has fully dissolved. Place the bowl in the fridge to chill for 15 minutes. Take the bowl out of the fridge and stir in the tequila, triple sec, orange liqueur and sweetened lime juice. Gently stir in the sparkling water. Spoon the mixture into 24 small cups or into hollowed out lime halves* (we went with lime halves). Sprinkle the lime zest over the individual portions and place them in the fridge for 4 hours or until they’re set. Sprinkle the salt on right before serving. *In order to get your hollowed out lime halves, first cut the limes in half horizontally. Using either a paring knife or a grapefruit knife, cut around the insides to release most of the flesh from the shell. Use a pair of scissors to cut away the central membrane found at the bottom, removing everything from the inside afterwards. Place the shells in muffin tins (we had to use a mini muffin tin for ours) to keep them upright and pour in the gelatin mixture. We didn’t measure how much we poured in but they suggest about 2 tablespoons per lime half. You can definitely taste the alcohol in this ! It looks really cute being in the limes but it takes a lot of time and work to get the limes hollowed out so if you’re short on time or patience, we’d suggest going with cups instead. When it comes to eating this, you’re going to need a spoon or else cut this in half and eat it right out of the wedge. It’s too messy to eat it right out of the lime half. The salt really does make this taste better. We weren’t paid in any form to promote Patrón, Jose Cuervo, Grand Marnier, Cointreau, Rose’s or allrecipes.com. Trim any excess fat off the pork before cutting it into big 2- to 3-inch cubes. Place the cubed pork in a large mixing bowl. Pour the olive oil into the bowl as well as adding in the paprika, cayenne, garlic powder, onion powder, salt and pepper. Toss to ensure that the cubed pork is evenly coated in the oil and spices. Take a stockpot out (we used a Dutch oven) and set the heat to medium on the stovetop. Once it’s hot, add the pork into the stockpot, searing on all sides until it looks nicely browned (we seared our pork in 3 separate batches so all of the pork could have a chance at getting a good sear). Pour the chicken stock and pineapple juice in, stirring to mix afterwards. Put the lid on the stockpot and cook on low so it can simmer for 4 hours or until the pork is easily pulled apart. Drain any excess liquid and shed the pork using two forks. Make the salsa simply by taking a large bowl and adding all the salsa ingredients into it, stirring to combine. Place the shredded pork in the warmed tortillas and top with scoops of the salsa and some dashes of the hot sauce. We fell in love with this dish. The pork was nice and tender and had so much flavor. The only problem we had with it really was that it was a little salty so next time we fix this (and there’s definitely going to be a next time) we’ll try adding just 2 teaspoons of salt. The pineapple salsa, that was addictive ! You definitely get the heat in this but despite the spiciness you can still get a nice sweetness from the pineapple and it just becomes this sweet and spicy combo that you want to put on as many things as possible ! The taco’s great with or without the hot sauce but if you choose to use it then you’ll get that much more flavor and a little bit more heat. We weren’t paid in any form to promote Taco Bell or Chile Pepper magazine. 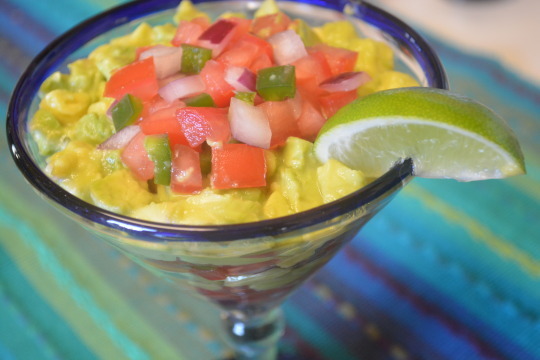 In one bowl, mix together the diced avocado and lime juice, adding salt to taste. In a separate bowl, mix together the tomato, red onion, jalapeño and salt to taste. 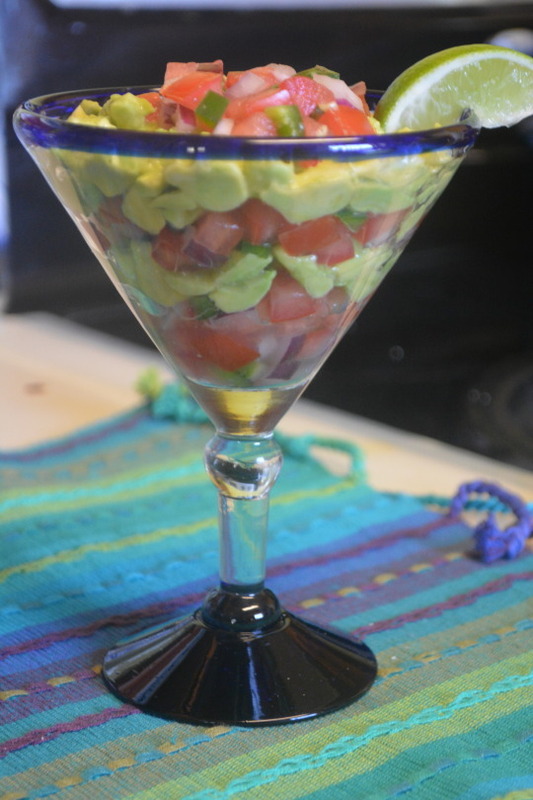 In a martini glass, layer the avocado and tomato mixture (we start the parfait with a layer of the tomato mixture). Top this with any cilantro, lime wedges and tortilla chips you may be using and enjoy ! This was a simple but tasty guacamole. You could taste every component in this. Even though the jalapeño was seeded we could still get a little bit of heat.